George Russell scored his second win of the 2017 GP3 Series season after being fastest in the opening race at Silverstone. 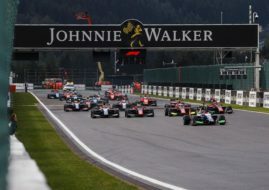 The pole sitter Russell quickly lost the lead to his ART Grand Prix teammate Anthoine Hubert but not for a long time as the British driver gained back leading position. At one moment, the top 5 were within two seconds so the fans could enjoy in that battle. However, in the mid-stage of the race, Russell, Hubert, and Niko Kari were able to run away from their rivals. On lap 13 the virtual safety car was deployed after Ryan Tveter’s car stopped on track. After the restart Alessio Lorandi overtook Kari for P3 and the battle for the victory again was completely opened after 1.2s covered the top 3. At the end, Russell took the chequered flag while Hubert and Lorandi completed the podium in the first race of the third round. The Race 2 of the GP3 Series at Silverstone will go on Sunday, 09:00 CET.